Yesterday was a glorious day, weather-wise. Lucky for us Daddy came home early and we all headed to Liberty Heights Fresh to pick up dinner in the form of a picnic. We chose a Crumb Brothers baguette, Salami from Ticino, Switzerland (ironically I just mailed an Ebay package there yesterday too! 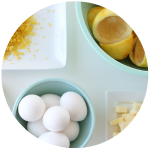 ), LBH potato salad, organic grapes, Cowgirl Creamery cheese (Mt. Tam), olives marinated in herbes de provence and a Mr. Browns chocolate bar for dessert. Yum. 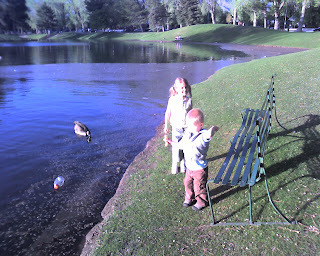 Pictured below are the kids using the leftover baguette to feed the ducks. This picture doesn't really capture the evening glow as it was taken from Ben's phone, but you get the idea. It was the perfect way to spend a Monday evening. On the way home we took turns telling each other things we were grateful for in our lives. This was not only a lot of fun, but a good exercise for any human being. Good jobs guys. Sounds like a wonderful FHE.